NordicTrack E 9.0 Elliptical is a one of the most selling ellipticals in the world. It comes with 30 built-in workout target different body parts and its 24 digital resistance levels pace up the calories burning. E 9.0 Elliptical has many valuable features which attract every fitness concious person towards it. This front drive elliptical also has dual grip heart rate monitor with big 7'' backlit display. Comercial Grade-Able to withstand the most rigorous workouts, this heavy-duty elliptical has a tough commercial-gauge steel frame. Weight Capacity-This elliptical accommodates up to 350 lbs. Front Drive-Step up to a maximum stride length and an extra smooth ride with a front drive elliptical. These ellipticals offer a small footprint with large calorie-burn results. Crank up the resistance to get your heart pounding and you’ll be on your way to your fitness success. Resistance Levels -To burn more calories, increase intensity or improve muscle tone, all combining for faster results, simply adjust the elliptical’s resistance. Adjustable Stride Length -To improve your workout, try adjusting the stride length with the Power Intensity Ramp—it will change the way your muscles work just enough to help you achieve greater muscle definition. Power Ramp -Get better results by changing the incline of the elliptical from -10° to 20°. It will modify the shape of your stride, which alters the muscle groups you focus on during your workout. As you increase the incline you target your glutes, hamstrings and calves. Silent Magnetic Resistance -This smooth, frictionless resistance system allows you to adjust your workout intensity without interrupting your workout. Choose from 10 resistance levels to target specific workout and conditioning goals. 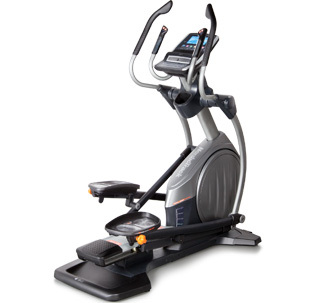 Warranty-The NordicTrack E 9.0 Elliptical is protected with a Lifetime Frame, 3-Year Parts and 1-Year Labor Warranty. Built In Workout Apps-Get the workout you want with 30 built-in workout apps. Choose from 20 workouts that specifically target your glutes, hamstrings, quads and calves. Backlit Display-Perfectly clear and easy to read, this backlit display has a large viewing angle so no matter how tall or short you are, you can always keep track of your workout progress. Heart Rate Monitor -Maximize your heart rate training with the included pulse strap.This elliptical also features 2 hand-grip sensors that are conveniently built-in to the handlebars. Upper Body Grips -Burn more calories and add muscle tone with the Soft Touch Upper-Body Workouts Arms that provide a great total-body workout, increased cardio benefits and a comfortable grip. Cushion Pedals- Adjustable, Oversized Muscle-Tone Cushion Pedals. Autobreeze Workout Fans -Quieter than a whisper, this workout fan automatically changes airflow to match your workout speed. Touch Handle Controls -Quickly scroll through your resistance and ramp settings with these convenient Quick Touch In-Handle Controls. Intermix Acoustics -Enjoy your favorite media with this built-in sound system that produces a broad range of frequencies and rich, equalized sound. Transport Wheel -The built-in wheels make moving the elliptical from one place to another fast and easy. IFIT Compatible- Introducing the only wireless connection between the Internet and home fitness equipment—iFit. Now you can work out with Jillian Michaels, customize your own fitness program, receive automatic workout downloads and manage your profile online. ToughTrain 3.0 out of 5 Best for begginers, worthy machine with descent price. TreadmillDoctor.com 5.15 out of 10 A stripped down version of the E12.0 is a solid machine. *Note: Most of the sites, stores or shopping portals listed above sell NordicTrack E 9.0 Elliptical with discounts and other exciting offers. There is a possibility that the some of above websites are not selling NordicTrack E 9.0 Elliptical now. Toughtrain.com is not liable for such cases or instances. Also we do not recommend any seller for NordicTrack E 9.0 Elliptical and a buyer should buy from where he/she gets best deal with quality of products, service and on time delivery (shipment).